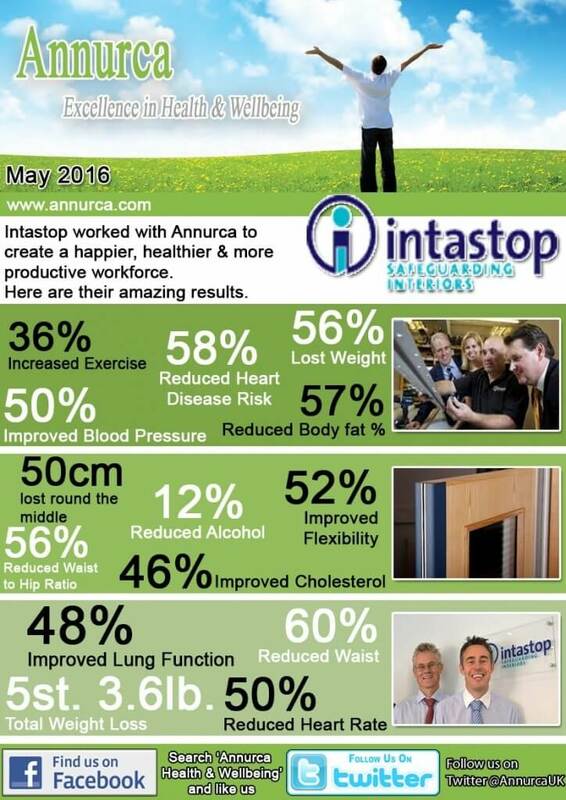 Annurca have been working with Intastop for a number of years to help educate and encourage employees to make healthier choices. On each occasion Annurca have visited Intastop, improvements of general health have been clear for all to see. This is very encouraging and rewarding for us all here at Annurca, as it indicates that we are making a difference towards the lives of poeple, and subsequently, creating a more proactive workforce by increasing productivity and morale. So, a little bit about Intastop and what they do as a business. Established in 1992 and based in Doncaster, Intastop have evolved into a leading market supplier. Their target is to be a dynamic market leader in providing quality products and outstanding customer service for safeguarding interiors. With over 20 years experience in meeting the demanding needs of hospitals, airports, supermarkets and similar locations, Intastop offers a range of innovative and cost-effective protection solutions that increase building life and reduce maintenance bills. Many products are intended for retrofit projects, enabling protection, performance, functionality and interior environments to be updated without significant investment or interruption. Annurca have thoroughly enjoyed working with Intastop over the years and have seen steady improvements upon each visit, and will continue to work with Intastop to help maintain good health. Upon our most recent visit, Intastop have demonstrated some astounding results, a terrific achievement. Massive congratulations from us all here at Annurca! We always advise that a wellbeing programme is the way forward after an initial health assessment, to help towards achieving a healthy lifestyle. Intastop have worked with Annurca extremely hard to achieve this goal, and the results above clearly demonstrate that determination and desire to reach their goals. Every individual has their own personal target and Annurca works with them to help them achieve those goals. However collectively as a business, over the past two years we have seen a dramatic improvement, something we’re very proud. Again, a very big well done from us all here at Annurca, let’s hope the next visit proves to be another successful one.